Many tourists have asked me the question ... why take the road via Mirik to reach Darjeeling? After all it's a longer route. Well, I love to take this route when I visit Darjeeling or at least on my return. If you plan to visit Mirik, you will need to take this route anyway. But even otherwise for visiting Darjeeling, this route offers something special. Yes, it's true that the route to Darjeeling via Mirik is longer and takes about 1 hour more compared to the normal route via Hill Cart Road or Rohini. It takes about one and half hours by car up to Mirik and another two and half hours to Darjeeling. So with a break in between, it will take about 4.5 hours to reach Darjeeling by this route from Bagdogra airport or NJP station. But this longer journey is worth the time & money. The route passes through scenic tea gardens, actually several of them, beautiful view points (probably the best in Darjeeling area to view tea gardens & landscapes), Indo-Nepal border with viewing point, nice quaint villages and more. If you start from Bagdogra and take a pre-paid taxi towards Mirik, the driver will tend to take a route via Panighatta. This road is shorter by some 10kms. The first section of the route goes by scenic tea gardens in the plains and then the Khaprail village up to Panighatta, but then for about 1.5kms, it's really bad. After the Panighatta township, there is virtually no road. 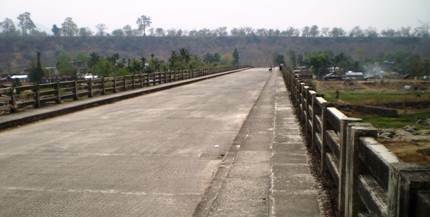 A dirt road full of pot holes goes through a forest and then by the side of the Balasun river bank and eventually crosses the river over Balasun bridge to finally meet with the main route. The stretch through the forest is quite lonely. Update April 2016: The last 1.5kms stretch on this route has now been done up and the entire route via Panighatta is now wonderful and much better than the alternative route via Matigara. The Balasun river has virtually dried up here. 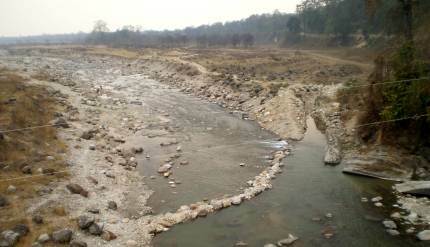 An alternative route is via Matigara (a small township) which is located on the main highway (NH-31). At Matigara, you will turn into a road that goes towards Simulbari. The first route via Panighatta also meets this road near Simulbari. However if you are coming from NJP, the driver will usually take a route via Sukna as that turns out to be shorter than the rest. This route from NJP will come initially through Siliguri township, then take Hill Cart Road towards Sukna, and then take a left turn passing through Mahananda Wildlife Sanctuary's forested area and the Sukna Military camp area and finally joining the common point at Simulbari. 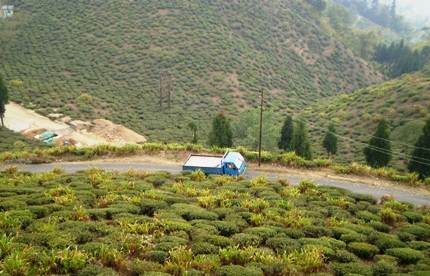 As you approach Similubari, you will see the beautiful Simulbari Tea gardens. But you are still on the lower plains. Soon you will start the uphill journey after you cross Dudhiya (another settlement along the way with a busy roadside market). In fact Dudhiya is the last point after which the uphill drive starts. One of the reasons some prefer to take the route via Mirik is because the gradient on this route is quite less compared to the other routes. So if you or someone in your family have problems with steep winding roads, then this route can be a better choice. But don't think that this is going to be like a flat city road anyway. There are several sharp turns along the way. As you start your uphill journey through this route, you will soon pass by beautiful tea gardens on the hill slopes. Some of such tea estates includes Tingling & Shingbuli, Phuguri etc. 8kms before reaching Mirik, you will come to one of my most favorite View Points in Darjeeling area, known as Tingling View Point. You get stunning view of the Tingling Tea Estate from here. The view Point is also known as Sourenee View Point because of the nearby Sourenee Tea Estate. The view of the gardens on undulating slopes of the mountains is just awesome. Just below the Viewing Platform (which is accessible by a short staircase), you will find the Sourenee Tea Showroom. This is where you can get authentic packaged tea of Sourenee Tea Estate. There are chairs where you can sit and enjoy the views outside. Adjacent to the Tingling Viewpoint, there is a small restaurant which sells tea and snacks. There are tables and chairs where you can relax and enjoy the food. The charming lady at the counter is quite efficient. Go to the backside balcony of the restaurant and you will get unabated awesome views of the tea gardens from there. 1km from the Tingling View Point you will pass by the village of Sourenee. Watch the villagers and the children on the road, the many tiny stalls as you pass the village. Soon you will reach Mirik, whose main attraction is the Mirik Lake. This is where you can take a break for few minutes before proceeding for Darjeeling. But note that the pre-paid taxi drivers are usually reluctant to make stops. Either request them or pay them a bit extra to take these breaks. I have described the route and rest of the journey between Mirik and Darjeeling in my article Darjeeling to Mirik Day Trip (you should reverse the order though because it narrates from the other way, i.e. from Darjeeling to Mirik). Visit Transport Fares to know about fares to reach Mirik and Darjeeling. Dear Sir, We will be landing at Bagdogra around 1.15 p.m. Will it be ok if we take the Mirik route to reach Darjeeling. While enroute will it be possible to see Nepal Border market and other places like Lakes? Mirik lake will be on the way and you can spend a few minutes there. The main Pashupati market at Indo/Nepal border is about 1km walk from the border and you won't have enough time for that, although there are few shops near the border which you might be able to visit depending on how you manage your time. The shops close down by sunset. Note that pre-paid taxi fare from Bagdogra airport does not cover all these local sightseeing and you need to pay extra to the driver for such stops. Sir, is there direct taxis running from New Jalpaiguri or Siliguri to Darjeeling via Mirik? No, there is no direct shared taxi in that route, but you can go up to Mirik and then take another one from there up to Darjeeling or Ghum. Dear Raj, We are visiting Darjeeling and Sikkim from 19th to 28th May. We are coming to Bagdogra by air and directly proceeding to Mirik and same day to Darjeeling. Please guide me are there any sweet marts on the way to Mirik where I can buy some namkeen and sweets. If so name of the shop. or are there any shop in Mirik ? Because I do not want to carry any thing from Bombay. 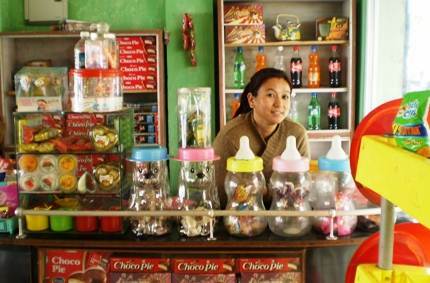 Hello, The restaurant at Jagjit hotel in Mirik has a shop where you can buy such snack items. 1)will there be any problems if we plan to take a shared car from NJP to Mirik, having done local sightseeing then take another shared car to Darjeeling. If not how will we go for local sightseeing, is any car or auto available for that on private or sharing basis. 2)if we take prepaid taxi will the driver allow for local sightseeing at Mirik on extra cash payment and how much the amount could be approximately. 3)how much time usually it may take if we go for this plan to reach Darjeeling from NJP. Take a shared jeep from NJP up to Mirik (about 1.5 hours). Spend some time at the lake area, do some paddle boating if you want, walk up to the Mirik Monastery (about 25 minutes from the lake), then come down and have your lunch. Post lunch, take another shared jeep for Darjeeling (usually available up to 3pm from the stand near the lake). Otherwise take a private sumo (will take about 2.5 hours to reach Darjeeling). Ask the driver that you will stop at Simana (Indo Nepal border viewing area). Pre-paid taxis from NJP may not agree to do sightseeing at Mirik or along the way, and even if they do, the charges can be quite high. 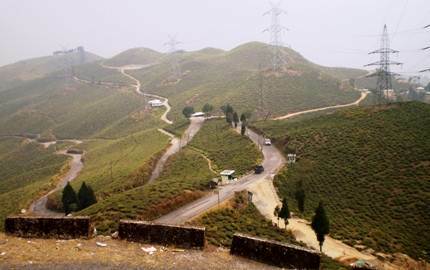 But if you can take a private vehicle from NJP, you can cover an additional point located 8kms before Mirik ... Timling View Point, one of the best places to view tea gardens. This won't be possible with a shared jeep. Dear Raj, At the very outset I like to thank you for your informative answers. This is Major Naim from Bangladesh. I will be visiting Darjeeling After 10th of October. My Plan is to return through Mirik while coming back to New Jalpaiguri. I will be accompanied by my wife &kid. If I am hiring a taxi from Darjeeling via Mirik to NJP will it wait for long in Mirik until my total visit time (around 2-3 hrs)? As we are Bangali so, we like to have lunch in Krisnanagar in Surojit & Boudi's hotel. Now if I want to avail any shared jeep/bus for going to NJP for that is there any cab stand in Mirik? What should be the last time for moving out from Mirik? Is there any bus/ shared taxi available to Mirik? Or it is better to hire a taxi upto Mirik to watch various view point like Jorpokhri, Market, Simana, Gopaldhara Tea Estate etc? Your guidance in this regard will be highly appreciated. Thanx. Hello, Shared jeeps are available between Darjeeling & Mirik, and Mirik & NJP. But they stuff in 12-14 people in a jeep in high season and it can get extremely uncomfortable unless you are used to such travels. Private taxi is a much better option, but in high season they can charge a lot. You can keep the cab waiting at Mirik but will need to negotiate a waiting charge which won't be small either. There are taxi stands in Mirik, both at the main market as well as at Krishnanagar area (near the lake). You will get shared jeeps also from these stands. If it can be afforded, I would recommend that you take a small private cab from Darjeeling, negotiate the rate and stop at Jorpokhri, Simana, (skip Pashupati market .... all trash), Mirik, Tingling view point (8kms from Mirik) etc. Surojit's Kolkata Hotel in Mirik is unfortunately no longer a great place to have Bengali food. My last week's experience was quite bad. He is charging exorbitant amount for less than average quality food and low portions.... basically encashing on opportunities. I have also observed him misbehaving with guests. You can try the restaurant located adjacent to it on its left (Annapurna), although I haven't tried the food there but heard many tourists are now preferring that. Hi, I have read your blog where you have suggested to visit Mirik on the way to Darjeeling from NJP or the other way round etc. but can you just suggest me where to keep the luggage when I would be visiting mirik on my way to Darjeeling from Siliguri or NJP. In this case I would like to inform you that i would be taking a shared jeep from NJP to Mirik and then Mirik to Darjeeling. this would be a cheaper option to me. would you kindly give me the details regarding this. I would be reaching NJP by Darjeeling mail. You should not plan Mirik day sightseeing while on your way to or from Darjeeling on a shared jeep with heavy luggage. Nobody will keep your luggage. You can plan such visits only when you are taking a private taxi so that you can keep your luggage in the boot.